Quick overview: An easy to learn tip to help you or your students narrow down searches with Google. What does it do? Many teachers have already discovered that Google (http://www.google.com) is a great resource for finding class materials. But did you know that there are a few EASY tricks to help narrow down your searches? Keep reading for a good one..
How can it be used in the classroom? Let’s say you were doing a project with your students on birds, with a focus on Blue Jays. The problem you may encounter is that you’ll likely find more material on the Blue Jays baseball team instead of Blue Jay birds since they share the same name. 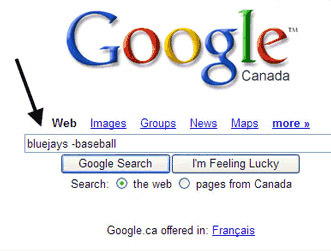 So how do you tell Google to search ONLY for Blue Jay birds? In order to tell Google exclude certain content from a search, you could use a minus symbol in front of words you don’t want to search for. It’s important to have a space between the words you enter and the minus sign (see below) or Google will think that the two words are hyphenated. This entry was posted in Tools and Apps and tagged google, search. Bookmark the permalink.